Welcome to the blog hop. Welcome to the new catalog! Hopefully you’ve arrived from Stefanie’s wonderful Crafty Medic blog. Stef is indeed one crafty medic. She’s also one of our Canadian contributors. Her blog is definitely one I turn to when I need to jump start my mojo. She has some wonderful videos too! As usual you can follow this hop in a circle going either direction. Of course you can also return to the home hop site if you ever get lost along the way. And here are all the pieces. I left the inside sentiment blank so I can customize it when I’m ready to use it. tip: To make your own template: First put the box together and then flip the box upside down with the top flaps folded out and draw around them on a piece of copy paper. Then cut out, place on top of your designer paper, trace and cut The perfect tool to use to fit your paper to the box. Easy peasy. I’ll save the template pieces for future box decorations. Did you spot the new product? My favorite new paper stack…Pretty Petals. Trust me…you’ll be buying lots of this stack! And the Just Because sentiment is from the new stamp set Tin of Cards (this is one set you will find yourself using for just about everything!). The tag ends used the new Triple Banner Punch. The Note Tag and Bow Builder Punches are carryovers from the previous seasonal catalogs but new to the Annual Catalog. This card doesn’t unfold (unlike the take out box version). The inner card just slips out and you can write on the front or the back. You can also glue down or add a pocket for a gift card. Can you spot the new products? Greetings Thinlit die (yep…a favorite already), Go Wild paper Stack and the sorta new punches I noted above. I love that the bow tie was created from the flip side of the vest paper. Way to go Stampin’ Up on coordination yet again. 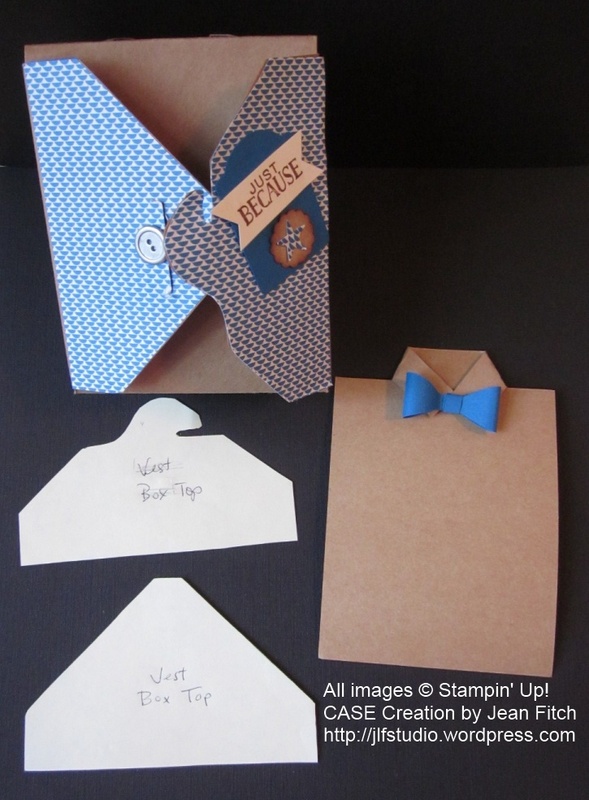 Both versions of the vest have a pull out card where you can stamp or write your heartfelt sentiments. And the Take Out Box also opens (without destroying the card) to hold a lovely treat for the man in your life (though of course some of us women also like vests, ties and treats too!). Hopefully it’s clear which supplies apply to which version. The box uses the blue theme from a Pretty Petals page and the card uses the neutrals from the Go Wild stack along with coordinating cardstock papers. As I mentioned before I was jazzed that the flip side of the vest was perfect for the bow tie. Meant I used up most of one 6×6 page for the entire card. I don’t know about you…but I’m loving the new 6″x6″ paper stacks. So many projects only need one page where before they needed close to two! Perfect for some of the punch board projects too that start with that size! 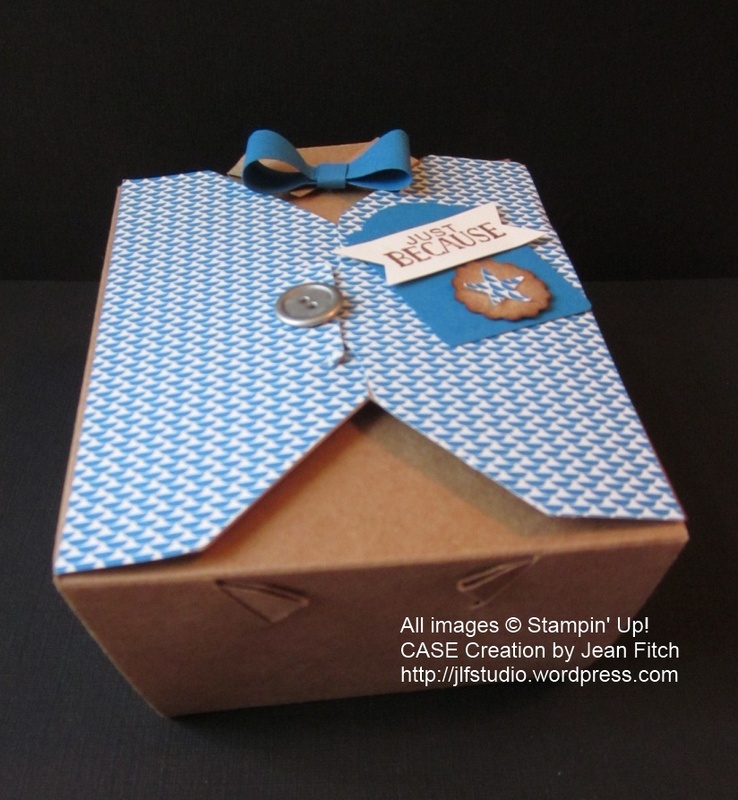 The take out box version was inspired by our Demonstrator only, Stampin’ Success Magazine from May/June. Took a bit of figuring how those wonderful Stampin’ Up Artists put it all together but it didn’t take long. Of course other crafty demos quickly figured out how to turn this into a fun card as well. I CASE’d my version (with a tweak or two) from Sharon Armstrong, a sister demo. 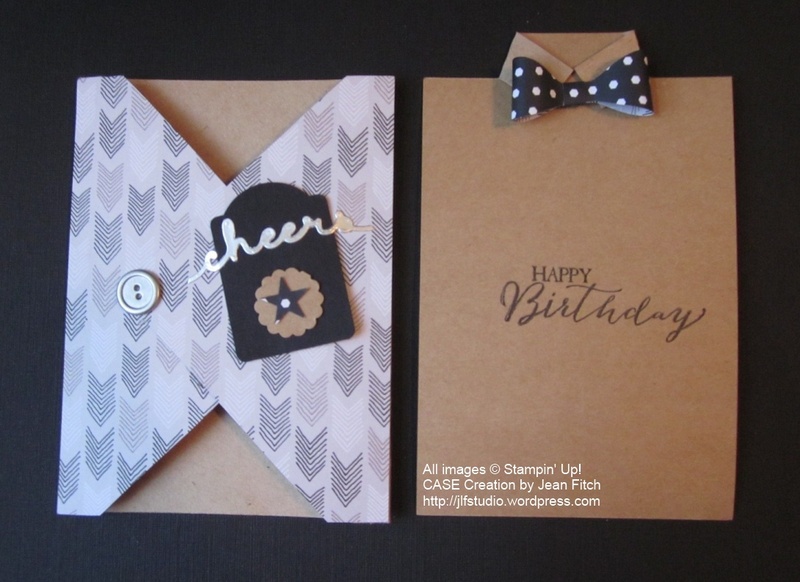 Since I created these projects for a recent event as well as the hop I thought I’d simplify things for you by sharing the directions from the event as well as a link to a video that explained how the card version was created using the Envelope Punch Board. That’s it for my share of the hop. Time to move on over to Miss Buffy’s wonderful post sharing her always creative outlook and gorgeous projects fashioned from new and old products from the new catalog. Those vests are very cool Jean! And thanks so much for sharing the directions. I’ve never tried to tie a bow tie so I can appreciate how the punch would make it much easier. Ohhhh. I was so surprised to see the box! How cute is that. 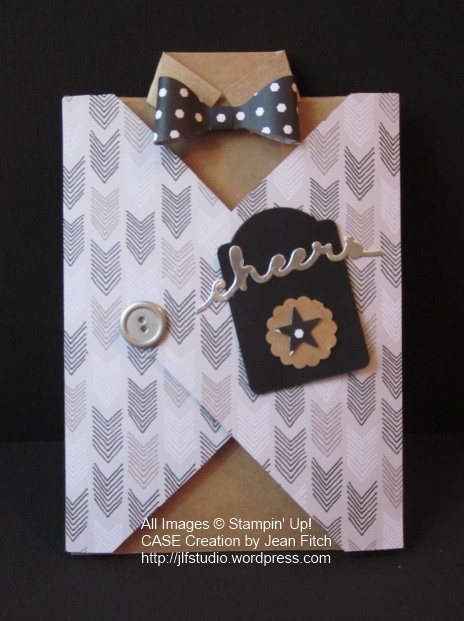 And, then the vest card….Wow…thanks for sharing! I will be book marking the instructions! What a perfect gift or card for Father’s Day! The best box is simply a delight. Thanks for including the instructions and your inspiration. I feel a CASE coming on. The paper is amazing. In the wee hour sof the morning when I wrote this comment, I think I meant to say the “box is simply the best and what a delight”. No matter how you say it, great projects Jean. Well, since this Sunday is Father’s Day and today is Friday before, I don’t think I will be able to do these. They are sooooo cute, Jean. Such a cute vest, Jean! I love it. Thanks for the instructions, too. So clever, and perfect for Father’s Day! Cute projects, Jean. Love the Father’s Day vest. hello jean, nice projects! Hope you’re keeping well. 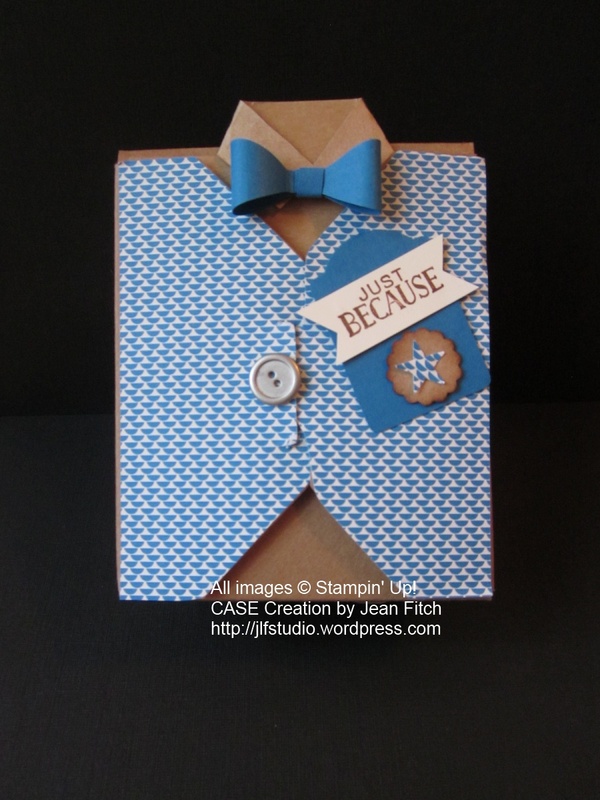 Jean, love your shirt box idea! Thanks for the great explanation of house to construct this project. So I was looking at your vest and thinking, hmmm, I just made one of those cards for my Dad’s birthday. Then I scrolled down, and realized it was a Take Out Box! Fabulous! I love it! Thanks for sharing the directions…this is too cute! Hi Jean, thanks for continuing to take part in our fun Blog Hop. Great projects.